SAP Is a great Career Option for any Professional. Today SAP Is the Leading Software Company in the world. It has a lot of scope Worldwide & SAP can open doors to a Top Career with any of your dream MNCs ( IBM, WIPRO, TCS, CTS, HP, SATYAM, BOSCH etc., to name a few). SAP has great scope in the field. SAP Course is highly sought after & gives you a global platform. Currently the Requirements are very High.. It is today the Best Career option. Your only focus would be to get certified. Once you are certified, Sky is the limit. SAP is considered as the high paid platform in the job market.SAP has various courses to offer. Based on your Qualification/ Experience We would suggest a suitable course.These Modules offer a lot of Scope. Please check & feel free to revert back for clarifications. 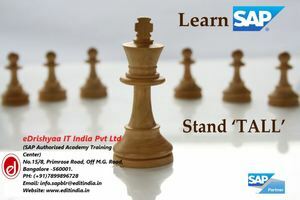 eDrishyaa is an authorized training partner of SAP. At eDrishyaa our expert faculty will help you identify various components and SAP application. We know What it takes to deliver the right results to help you ace the SAP Certification Exam. eDrishyaa is a Pvt. Ltd Co. set up by 4 visionaries during 2009, which is exclusively into SAP Training and Certification. Our registered office is Bangalore and the Branch office is at Coimbatore. Coimbatore is the second largest city in Tamil Nadu after Chennai and is called the “Manchester of south India”, is a “Leading Educational and Health Hub” and is well known centre for SME industries. In the last 7 years of our existence at Coimbatore, a Tier-II city, we take pride in having shaped the career graph of professionals working in various core industries, by providing quality training and placed them as SAP Consultants in various MNC's pan India and abroad. No.15/8, Primrose Road, Off M.G. Road, Bangalore -560001.